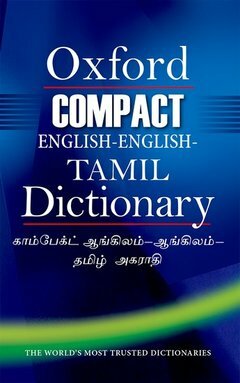 Coordonnateurs : Murugan V., Jayadevan V.
This dictionary contains more than 24,000 entries, related phrases, idioms, derivatives and words with irregular forms, and more than 200 illustrations. Like our other Bilingual Dictionaries, this has been specially compiled for learners of English, teachers, translators and general readers. Dr V. Murugan, retired Professor and Head, Department of English, Presidency College, Chennai, holds a D.Litt degree in Lexicography and Translation, and is the author of 15 books including the Tamil-Tamil-Electronic Dictionary, A Dictionary of Literary and Critical Terms in Tamil, Tolkappiyam in English, Kalittokai in English and Narrinal in English. He is the editor of the English-English-Tamil Dictionary from Oxford University Press India. Dr V. Jayadevan, retired Professor and Head, Department of Tamil Language, University of Madras, has also been Professor Emeritus, Department of Tamil Literature, and Chief Editor, Tamil Lexicon Revision Project, University of Madras. He holds a doctorate in Lexicography and has authored several dictionaries and other research publications. A former President of ASIALEX, he has also been General Secretary, Lexicographical Society of India.